Sweet juicy peaches picked straight from the tree... mmmmm that wonderful summer fruit. We are blessed, a next door neighbor a few years before we purchased our land had dumped the waste peaches from their tree onto our section. When we moved in there were at least 7 small trees. I have thinned them down to 4 different trees. The nice thing is that the genetics of the various trees mean we get a wider fruiting season than just one tree would give. 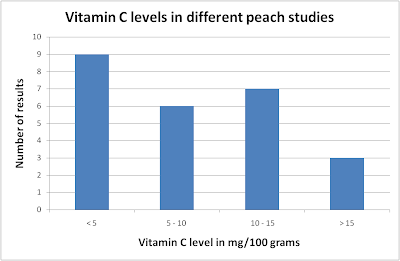 Was searching some historical papers and came across a 1942 paper that looked at vitamin C levels in peaches. In reviewing the literature they found many different stated levels. The graph to the right shows this. You can see how wildly peaches vary in their vitamin C content. This makes a mockery of the 6.6mg/100 grams (or any other figure for that matter) that is the accepted vitamin C level for peaches. The study also looked at different levels of vitamin C with respect to (wrt) location in the fruit. The skin, the outside 5mm of the flesh and the inner 5mm of the flesh. 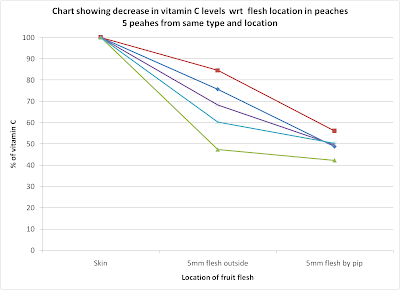 The vitamin C was highest on the outside and lowest in the center of the peach as the graph shows, again there is significant variation and these peaches were from the same farm picked at the the same time and of the same ripeness. The highest level being in the skin and outer most parts of the flesh is disturbing. It is disturbing because when the peaches are canned the skin and outer layer is removed. Often in food preparation of fresh peaches the skin and outer layer is removed. Once again we are throwing out the most nutritious parts of the food! Interesting enough vitamin C level increases in peaches as it ripens. Often vitamin C levels drop as the acidity in the fruit drops. Even more fascinating is that as the peach moves from ripe to soft and mushy the vitamin C level increases. There is about 150% increase from hard peaches to ripe, and 200-300% increase from hard to soft and overripe. Reference: G. M. Schroder, G. H. Satterfield, and Arthur D. Holmes The Influence of Variety, Size, and Degree of Ripeness upon the Ascorbic Acid Content of Peaches J. Nutr., May 1943; 25: 503 - 509.